Since its founding in fall 1998, the annual Accounting Challenge of the School of Accountancy in SIU’s College of Business has become an integral part of the rich tapestry of Saluki customs and history. 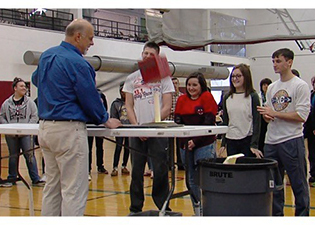 This year’s Accounting Challenge took place Feb. 19 at the SIU Recreation Center. More than 320 students from 24 local high schools and community colleges gathered at SIU to test their accounting and problem-solving skills in individual and team-building contests. The team-building contests highlighted the event. Students were assigned to teams and had to build a structure to protect three cherry tomatoes and a porcelain tile from a 3-pound hammer dropping on top of them. The purpose of this activity was to test the students’ ability to work in groups. Equally as popular were the tasks in which the participants had to assemble a cantilever or make a rocket shoot out of an air-powered cannon. The event kicked off with an academic challenge that consisted of 60 questions dealing with college-level accounting. “Based on the great number of laughs, I assume the students had a lot of fun,” said Joshua Lohmann, a senior accounting and finance major at SIU who served as one of two student coordinators for the SIU Accounting Challenge. The other student coordinator of this year’s accounting challenge was Kyle Adams, a senior accounting major from Carterville, Illinois. The annual event occupies a special place in Lohmann’s heart. The Nashville, Illinois, native said he found his passion for data and figures when he was a high school-age participant. Lohmann’s story is just one of many to emerge from the traditional annual event, which aims to spark interest in the profession of accounting – and the School of Accountancy at SIU Carbondale, too – through humor mixed with academic and problem-solving challenges. The event is sponsored and hosted by SIU Carbondale’s College of Business. Individual and team winners of this year’s Accounting Challenge received certificates along with scholarships worth up to $500 if they enroll at SIU Carbondale and major in accounting. Trophies were given to the highest-scoring team of the tomato-smashing team-building contest. Both student coordinators of the 2016 SIU College of Business Accounting Challenge said they were very pleased with the turnout – and the smooth operation of the event, too. First place: Johnathan Bryan, Centralia High School, $500. Second place: Jonathan Payne, Mount Vernon High School, $300. Third place (tie): Daniel Huggins, Pinckneyville High School, Drew Reed, Centralia High School, and David Robbins, Carterville High School, $200 each. First place: Victoria Birchem, O’Fallon High School, $500. Second place: Spencer Woll, O’Fallon High School, $300. Third place (tie): Cameron Beers, Marion High School, and Parker Moses, Flora High School, $200 each. Second place (tie): Brandon Arrowood, Shawnee Community College, and Brian Adams, John A. Logan College, $300 each. Third place: Olivia Christian, Southeastern Illinois College, $200. First place: O’Fallon High School: Charlie Eccher, Jhavont’e Hazlitt, Spencer Woll. Second place: Edwards County High School: Maverick Troyer, Faith Fisher, Olivia Loudermilk, Hannah Rotramel, Tayler Hayes, Maddy McKinney. First place: Marion High School: Alyssa Taylor, Sam Redd, Nicole Plumlee. Second place: Nashville High School: Ethan Small, Megan Williams, Hayden Heggemeier, Drew Barczewski, Brady Bultman. First place: Shawnee Community College: Alicia Chase, Jon-David Johnston, Evan Hughey, Brandon Arrowood, Ashley Graham.